Beginning as a method of preserving fish centuries ago, sushi has evolved into an artful, unique dining experience. In its earliest form, dried fish was placed between two pieces of vinegared rice as a way of making it last. The nori (seaweed) was added later as a way to keep one’s fingers from getting sticky. Technically, the word sushi refers to the rice (the Japanese word su means vinegar, and shi is from meshi, the Japanese word for rice, hence sushi is ‘vinegared rice’), but colloquially, the term is used to describe a finger-size piece of raw fish or shellfish on a bed of rice or simply the consumption of raw fish in the Japanese style (while sushi is not solely a Japanese invention, these days, the Japanese style is considered the de facto serving standard). This can be eaten as is, or is often dipped into shoyu (Japanese soy sauce) and then eaten. Great care is taken in the creation of the dish and the many methods of preparing the food indicate the importance of appearance to the educated consumer. Sushi is a work of art as much as a food, and while it is now available in a western ‘quick and easy’ serving style, the traditional ways are far from lost. What are the different kinds of sushi? Chirashi sushi is a bowl or box of sushi rice topped with a variety of sashimi. This is often a nice selection as you can choose to eat your fish as sushi or sashimi, and it is often artfully presented. Nothing says “Wow!” like a beautiful bowl of carefully presented seafood. Inari sushi is aburage (fried pouches of tofu) stuffed with sushi rice. Sometimes the aburage is soaked in mirin (sweet sake) and sometimes not, but either way, you have a nice pocket of ingredients that is easy to eat. Maki sushi (sometimes called norimaki) is when the rice and fish and/or vegetables are rolled up in a seaweed wrapper (nori). The roll is usually cut into six or eight pieces, depending on the thickness of the roll, and some itamae even place the items so carefully, that a picture results on the face of each piece. Thick rolls, often due to a lot of ingredients. Thin rolls, usually very simple rolls. Inside-out rolls, which is a newer style and non-traditional. An elegant and very artistic style of maki sushi that is usually made to show off the skills of the itamae as it often includes complex layering of ingredients. This type of roll is becoming more common in the West. Nigiri sushi is what one calls the little fingers of rice topped with wasabi and a filet of raw or cooked fish or shellfish. It is generally the most common form of sushi you will see. Temaki sushi is also called a hand-roll. This is a cone of sushi rice, fish and vegetables wrapped in seaweed. It is very similar to maki. Sashimi is raw fish served sliced, but as-is. That means no rice bed or roll, but it is often served alongside daikon and/or shiso. This is my favorite style as you really get the flavor of the fish. Plus, it’s a great way to impress sushi newbies! What are those other things I see on my plate? Depending on what you ordered and the whim of the chef, you might see items such as wasabi (the hot green Japanese horseradish-like rhizome), gari (pickled ginger, which comes in both a pink and a light tan color, with the lighter stuff usually indicating better quality). You may also see a large green leaf called shiso, which is often served with sashimi, and a shredded white mass of Japanese radish called daikon, which is also often served with sashimi. Where can I find sushi grade seafood online? 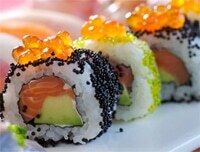 [about to post new link] has the best sushi grade seafood available, in my opinion. Check them out for almost everything you could ever want. 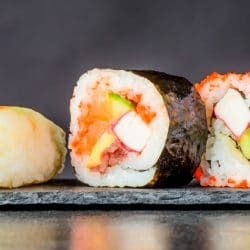 Since the list is rather extensive (and by no means complete), I have devoted an entire page to sushi terminology which also includes a pronunciation guide. Alternately bend and extend your forefinger and middle finger, letting the first stick PIVOT at the thumb. The thin tip of the moving stick will touch that of the stationary stick when you bend the two fingers. Don’t hold the sticks rigidly. Hardly any pressure or strength is needed to grasp things at the tip of the chopsticks.